Our Fairfax Location | BrightStar Care "
At BrightStar Care of VA - Fairfax, owned by Robert & Kerry Massie, our home care agency provides quality home care, caregivers, and medical staffing solutions to families and businesses in the Fairfax County area. We offer compassionate care, peace of mind and exceptional service — any time, any place. My wife, Kerry, and I are thrilled to bring a BrightStar Care agency to Fairfax, Virginia. Aging in place and with choice is one of the greatest challenges our society will face in the next 3 decades. We will focus our efforts on helping seniors make the choice on where, and how, they wish to spend their golden years. We promise to deliver quality, dependable care that can help make more possible for seniors and their families. Our recent experiences taking care of our own relatives long-distance drove home the importance of being able to find high quality home care for our loved ones. As Certified Senior Advisors, we know that aging in place is often optimal and we firmly believe that living more autonomously near family and friends enables a richer, fuller life. We also understand how challenging it can be to find quality professionals to help seniors remain independent and how important it is to enlist the trusted support that busy, often remotely-located, families need. Our dedicated staff is committed to delivering patient-centered, evidence-based home care services with compassion and respect. Our BrightStar Care team is available to you 24 hours a day, 7 days a week. Our experienced Nurse Manager, Lisa Natarajan, oversees each client’s plan of care to ensure that you receive the highest level of care and service. We hire, background-check, and train only the best caregivers, and we take pride in caring for our clients as if they are a part of our own family. Many of our programs, like our free CareTogether web-based community tool, are focused on ensuring coordinated communication across the entire care team- including the client, their families, other caregivers and their doctors. Our only goal is to ensure that you get only the best possible home care- quality services that meet or exceed the highest standards of care. Our BrightStar Care team will help you care for your parent, spouse, sibling or child and help you Make More Possible. Our local BrightStar team is available for you 24 hours a day, 7 days a week with an RN on call to provide the highest level of care and service. Please give us a call today at (703) 267-2380 and we'll be happy to answer your questions. BrightStar Care of VA - Fairfax is committed to delivering the highest quality care. We have voluntarily attained accreditation for our home care agency by the Joint Commission which is a nationally recognized quality standards organization with rigorous standards. The creation of BrightStar stems from the desire to create a great company with a great purpose: To provide families and their loved ones with the highest level of accessible home care, dignity, and personal attention they need and deserve. 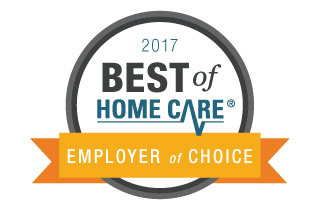 BrightStar Care in Fairfax has received both the Best of Home Care Provider of Choice and Employer of Choice Awards from Home Care Pulse. These awards are granted only to the top ranking home care providers, based on client and caregiver satisfaction scores gathered by Home Care Pulse. Only a small handful of home care providers across the country have proven their ability to provide an exceptional working experience to employees and the highest quality care to clients. BrightStar Care Fairfax, VA is very proud to be among them. 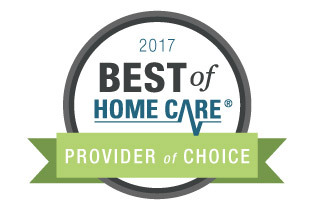 Best of Home Care Provider of Choice Recipients of this award are best in class for quality in home care. This recognition reassures you that your home care provider is dedicated to your satisfaction and will provide you with quality, trustworthy in-home care. Best of Home Care Employer of Choice Recipients of this award support and train their caregivers. Their caregiver satisfaction scores have earned them recognition as a top employer. This recognition gives you peace of mind, knowing your home care provider and your caregivers are dedicated to providing you the best in-home care possible. Proudly serving Washington, Centreville, Clifton, Chantilly, Herndon, Reston, Annandale, Dunn Loring, Fairfax, Falls Church, Great Falls, Greenway, McLean, Oakton, Vienna in VA.